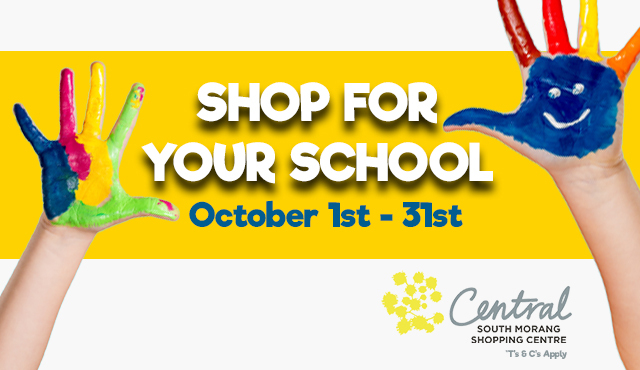 Central South Morang– $1000 to the school with the most spend per student at the end of the competition period. Entry is open to the public who drop their receipts into a school ballot box during the promotional period. Three schools are the elegible prize winners for this competition. To enter, Eligible Entrants must, during the Promotional Period (defined below) drop a valid receipt/s into their chosen school’s box (‘Primary Entry’). Entries must include spend information from a Central South Morang store with dates attached that confirm the purchase was made within the competition promotional period. There are no limit to how many receipts can be put into the entry boxes, however inaudible, incomprehensible, illegible, and incomplete entries may be deemed invalid. As many entries per person are allowed. The competition commences on the 01.10.2017. Entries open at 9:00 AM and closes 31.10.17 at 2:30 PM (‘Promotional Period’). All times noted in these Terms and Conditions are local times, based on the location of the Promoter. Entries must be received by the Promoter prior to the competition close date and time. One major winner will be drawn on the 29.06.2017. The ‘winners’ refers to the first valid entry drawn on the 29.06.2017 at 6:00pm. The Promoter will ensure that all schools participating have an equal chance of winning a prize. The wining school, determined by the highest spend per student (calculated by total receipts divided by number of students) will be notified by phone and email within 1 month of the draw if Their name will also be published once confirmed at facebook.com.au/centralsouthmorang. Prizes will be paid to the winning school by way of invoice. In the event a winner does not take the prize by the time stipulated (31st December, 2017), then the entire prize will be forfeited by the winner and cash will not be awarded in lieu of the prize. Prize will need to be invoiced to Central South Morang for prize payment to be awarded. All retailers are involved in the offer. If entries are damaged with or tampered with before the end of the promotion, Central South Morang has the right to decide the outcome and delegation of prize money should this be neccesary.